Greater fuel efficiency and less weight* – the STIHL HS 82 R is a win-win for professional landscapers. The “R” indicates a cutting blade designed for thinning, rejuvenation and pruning of woody shrubs and hedges. 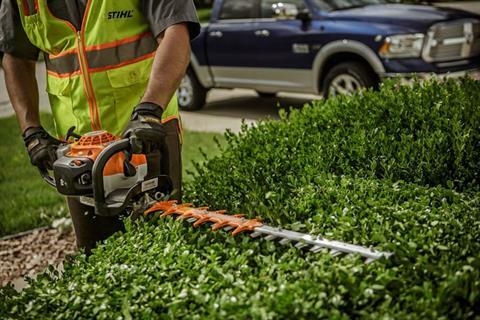 Available in both 24” and 30” blade length options, this hedge trimmer offers two ways to tackle trimming tasks. Even with its high torque engine, the HS 82 R uses 20% less fuel than previous models, reducing fuel costs and improving the bottom line. It also features low-vibration technology and a swivel handle for comfort and control when cutting.